The Global Point of Use Water Treatment Systems Market is estimated to be valued at USD 34.1 billion by 2025, according to a new report by Hexa Reports. Increasing water pollution coupled with growing awareness towards healthy lifestyle are factors propelling the market growth. Increasing adoption of water purifier systems is predicted to drive the global point of use water treatment systems market over the forecast period. Favorable government laws to ensure the supply of clean and potable drinking water are further expected to augment business growth in the coming years. The increasing demand for clean water coupled with growing investments to boost the efficiency is likely to provide a boost to the point of use water treatment systems market growth over the forecast period. 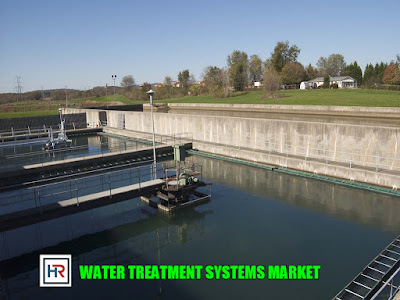 Significant reduction in the costs of raw materials and components along with favorable government initiatives is likely to encourage growth of the point of use water treatment systems market by 2025. Governments across the globe are encouraging wider adoption of water treatment systems, to avoid an epidemic of water borne diseases. In terms of technology, the reverse osmosis systems held over 43% of the global point of use water treatment systems market share in 2016. Established technology coupled with economical costs of units in comparison to other technologies is predicted to have a positive impact the growth of point of use water treatment systems market by 2025. Filtration methods technology segment in point of use water treatment systems market is predicted to be valued at USD 7.5 billion by 2025. Higher efficiency, enhanced capacity, and affordable pricing are projected to boost market growth during the forecast period. Tabletop pitchers segment of the water treatment systems market was valued at USD 6.9 billion in 2016 and is likely to be valued at USD 14.6 billion by 2025. Tabletop pitchers are widely adopted owing to the convenient use coupled with affordable price and longer shelf life of the product. In the devices segment, faucet mounted filters are the second largest with 80.7 million units sold in 2016. This segment has large scale penetration in Indian and African countries mainly due to its affordable pricing and low replacement costs. The U.S. point of use water treatment systems market, in terms of value, is predicted to grow at a CAGR of over 3.4% in the coming years. Favorable government regulations, coupled with financial benefits, are predicted to boost business growth over the forecast period. In 2016, the UK point of use water treatment systems market, in terms of volume, contributed over 31.9 million units and is predicted to reach over 102.9 million units by 2025. Under the sink units are more prevalent in the UK, given the advanced aesthetic sense prevalent among the customers in the country. India point of use water treatment systems market is likely to be valued at USD 1.9 billion by 2025. As of 2017, India is one of the largest market owing to be the second most populated country in the world.